Patchwork n Play: Where is Anguilla? way to me here in Australia! And another one to giveaway! I'll pick a winner in a week! Oh my, that is extreme! My mail, that I am aware of, has never had such an exotic vacation on the way to me. A parcel (fabric, of course) I recently received came all the way to Sydney and then was sent on to Kuala Lumpur, Malaysia before being re-directed back to me in Adelaide. I've had another which went to Sweden first and then on to Australia but none have gone to the Caribbean, I like being able to keep tabs on the whereabouts of a parcel with parcel tracking. It is so funny how the postal system works. I do not think I have ever received a parcel from somewhere strange. That fabric is gorgeous , the colors are so striking. I look forward to seeing what it will become. Gorgeous fabric, Some of my mail has gone to Tanzania, I Live in Tasmania so I guess its an easy mistake. I've had parcels go via Austria, I guess that's easy to confuse with Australia. Anguilla is much more exotic. Have fun playing with your stack of fabrics! No need to include me in the giveaway, I have too much fabric already. 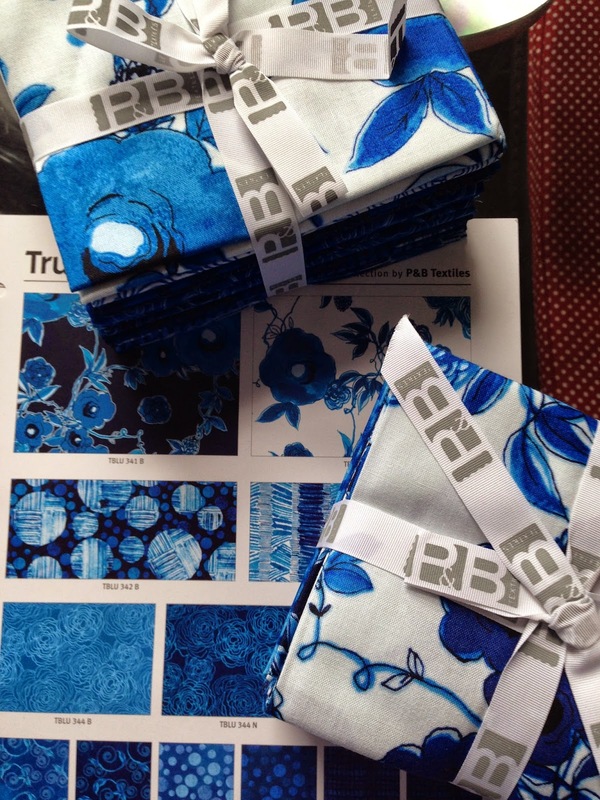 It's very generous of P&B textiles though so 3 cheers for them!! Well I live in New Zealand and it did take more than 2 months for a parcel to get here from USA last Christmas. The Fat Quarter shop said they had problems with all mail sent that day, so suspected the Post Office lost the bag after pick up and only bothered to deal with it after the Christmas rush was over. Recently in Germany, my husband sent a small packet that needed to be tracked. He was told where to write his address, and the address to where it was going. The next day it ended up being delivered back to our house! It was an expensive mistake, made by them I might add. He did get reimbursed. I don't think any of my parcels have been anywhere exotic but judging by the state of some of them some have been somewhere very wet!! When I worked at sea a friend was spending some time in New Zealand and decided to send me a sheep skin to make my cabin cosy. I am not sure where it went but that parcel took almost eight months to get to me, following me to different ships and ports around the world apparently. I caught up with me when I was docked in New Zealand. Typical! I can't think of any weird place my mail landed, with the exception of some of my relative's hands. Not such a weird place but I recently started a new job and my first paycheck was mailed to me. It never arrived but Fed Ex swore it was delivered. After quite the run around I found it one street over underneath the front mat of a house with the same number as mine. Pretty saturated colors! I hope it's the automation that does those stupid things and not the people! I haven't had a mail experience like that (that I know of!). That fabric is absolutely luscious!!! Nothing weird about my mail. It just usually ends up delivered to my neighbors by mistake. I sent an anniversary card to my parents one year, about 6 years ago, that still hasn't reached them. Oh how funny it your fabrics made a stop over in Anguilla. I have a good friend who is from there and over the past few months she's been posting pictures from there because she's really wanting to go back. The pictures I've seen are just gorgeous with crystal blue water you can look into and see all the way to the bottom. You should be jealous of your fabrics. 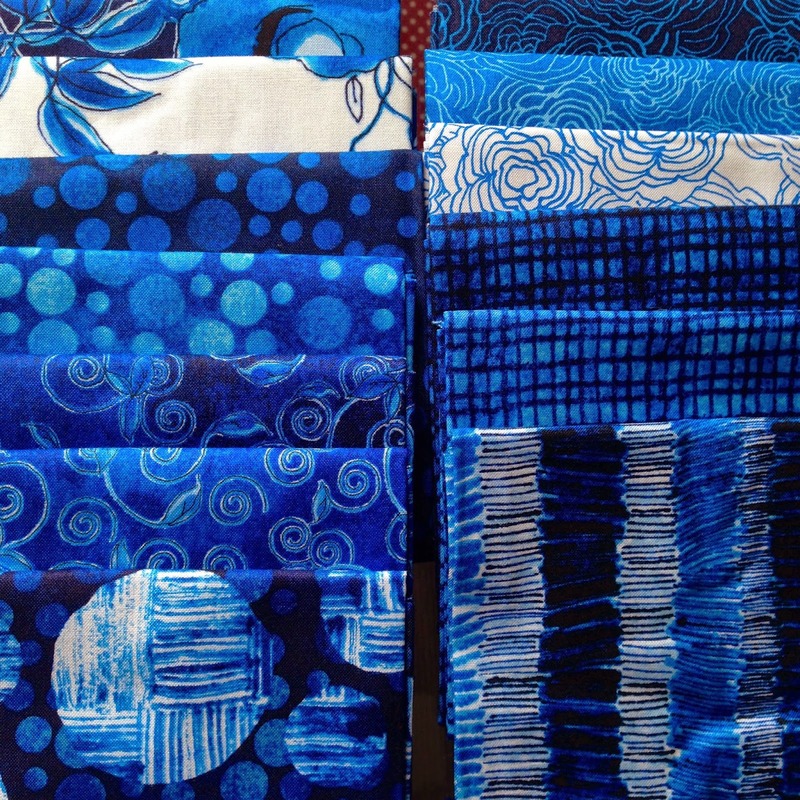 Heck, those gorgeous fabrics actually look like they'd belong there with those beautiful shades of blue. I only have one place a package ended up and that was nothing too exciting. We live in Northern IL and it was coming from Texas if I recall. Somehow it traveled from TX to the southern states like Georgia and Arkansas etc. Then it got all the way to Rockford, IL where at that point it should have been at our house the next day. Nope. Instead it decided it wasn't done and traveled back to Southern IL where it was overnight, then back to Rockford, THEN it went back to Southern IL again the next night to the very same town. We wondered if it would ever arrive at our house. Now whenever we see a package arrive in that town we wonder if it will yo-yo back and forth a few days before it actually makes it to our door. So far that's only happened twice and we still don't have a clue why. Luckily, I've had no major mishaps with mail or packages being delivered. The fabrics are gorgeous. Thanks for the chance to win. Well, the only weird mail issue we have had is when our envelopes for Molly's wedding were sent to my brother in law in Chicago. The calligrapher must have just picked up the address from the last name. We were sweating that one out a bit. 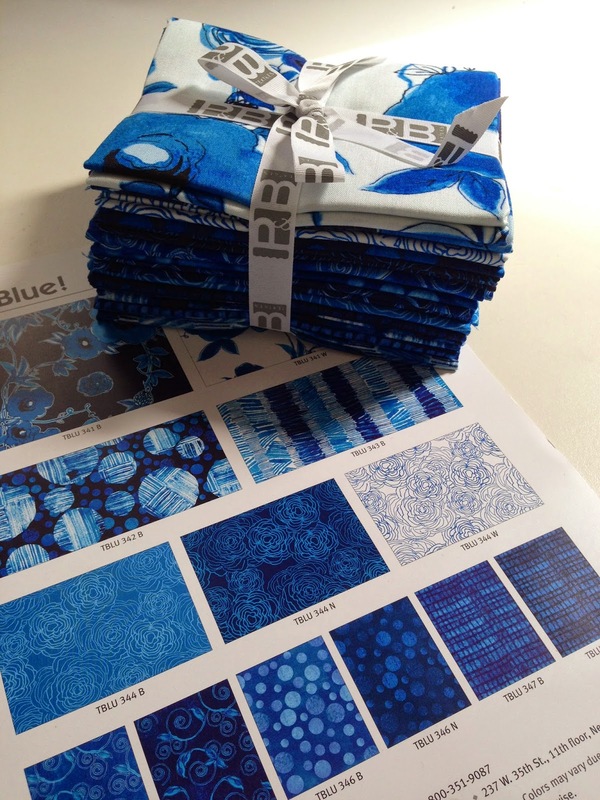 Beautiful blues from P & B .....I can't wait to see what you do with them! Touch wood I haven't had a missing parcel experience as yet! 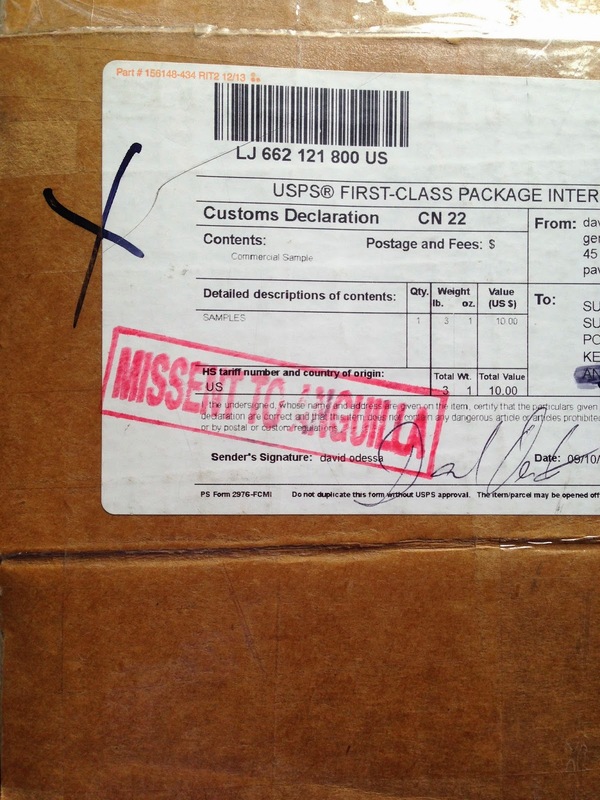 Your parcel mess up is too funny for words - perhaps all postal staff need glasses or a map of the world! My husband orders wine and has it delivered to our home. We have to sign for it so we always know it comes. It was late once and never did show up until we accidently found it down our outside stairwell. Guess whoever delivered it didn't want to wait for a signature and thought he would just leave it knowing we would eventually find it. Beautiful fabric!! My problem with mail was a "not 'received. We mailed your car insurance, we were both in the car, and the insurance company denied that they got it, canceled our car insurance, state sent a letter to pull our registration, what a mess!! We had our mail forwarded to Florida when we were there for a few months and one package decided to take a side trip to California which is not on the way from Minnesota! My strangest mail mishap wasn't that it was delivered to the wrong town, but that the PO apparently didn't read the address. I packed up a box for my niece for her birthday. When her mother said it hadn't arrived, I was quite upset because I had made her a life size doll and a matching outfit for her. Where was the box? At a stereo warehouse in the same town. I used a box my kids had gotten a stereo in...and the it was located in their hometown! (I didn't notice that at the time) There must have been a bunch of returns because my box was amidst all the others. They actually opened the box at the factory...why I don't know since the address was on the front and the package weighed a bunch less than a stereo would. They finally got the package to my niece, thank goodness! And by the way, she loved the doll! Thanks for the chance to win this great bundle!!! I loved seeing the parcel on IG, and I love seeing it here again. That's a pretty amazing mis-direction. Gosh, those fabrics are lovely! You didn't say whether you (or P&B) would ship the fabrics to the US, so if not, I'm still happy to tell my shipping story. Unfortunately, mine is sad. In 1996, my Swiss friend, Edith, and I decided to make row quilts. She spent considerable time thread-painting a row of edelweiss for me, and though she mailed it to Iowa, it never arrived. Poor dear made another one and sent it to me - though I told her she didn't have to. I often wonder where that row might be right now. Oh how funny! I can't say my mail has been redirected, but my luggage has! A few years ago, instead of my suitcase being sent to Dubuque, Iowa, "someone" saw the DUB and sent it off to Dublin, Ireland! I did get it back...about a month later. I have had mail going to India rather than Indonesia! Luckily it finally found its way here! 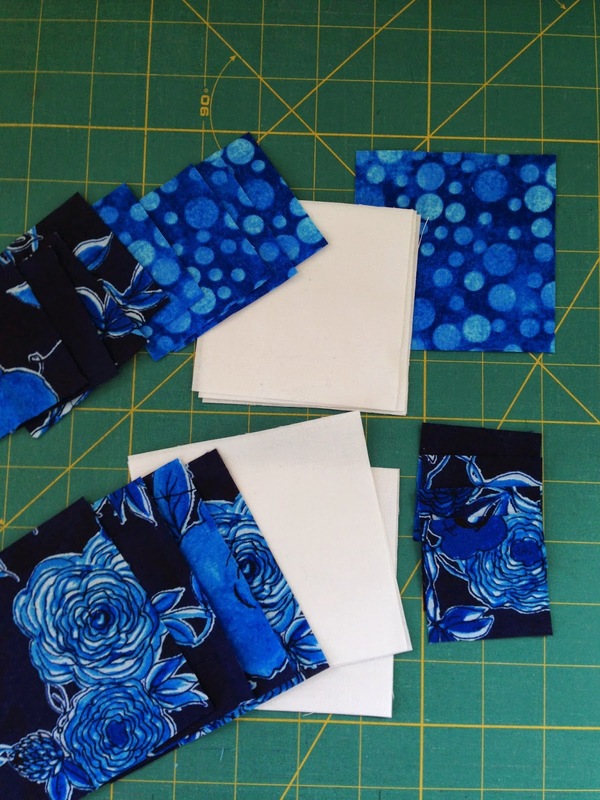 I have my fingers crossed for this giveaway - I have a request for a memory quilt and have been given a few t-shirts and a request for blue florals - so perfect! My mail once went to Romania. I lived in Chicago. It took 2 months for me to receive it. Strange but I did get it. I'm in love with this fabric. Blue is my favorite cool color and would make some fabulous bags for those on gift list. Beautiful collection of fabric. My package came from California to Florida to New York State(home) to be sent out to New Jersey(next state over) just to come back in and get sent to me. You package had some trip. Gorgeous blues! The only strange mail I can think of is mail I sent to the midwest USA ended up in California. My 30 year old daughter has yet to receive her birthday card from her uncle for her fifth birthday -- who knows where that went. Glad you eventually got your package. I don;t think I've ever had a package go too far a field like yours. My son was doing a semester abroad in Paris and we needed to send him his glasses and Allegra for allergies. He was over there for only a month so I sent the package Fed Ex 4 day air from Akron, OH USA. The package ended up traveling to the UK, Netherlands, Germany, and then stuck in customs in Paris. He was home for over 2 months before they redelivered it back to Ohio. I'm glad we got the glasses back but it cost a fortune and customs kept the Allegra. I've received mail that was torn, wet and partially burned. It had been in a plane crash and they put it in a plastic bag and delivered it. Interesting. Oh wow, that's fun! My mail either get to me or get lost who knows where :) thanks for the chance!! I have not had any major delays due to the postal service, but I have ordered an item online that was delivered to an old address three hours drive away. Thankfully the lady who lived there was kind enough to contact me. Unfortunately it contained several Christmas gifts that did not arrive in time! Beautiful fabrics! So far as I know, my mail has never taken any great trips, however, I did once get a birthday card in the mail that had apparently gone through a shredder. The post man delivered it in about ten even strips in a plastic bag with an apology- he wasn't quite sure what happened! That fabric really pops. Simply stunning. Thanks for the chance. The fabric is lovely....my worst mail...postcards from Turkey that never arrived but I did finally get the one from the Vatican over a year later!!! I used to write to someone in Egypt and it got returned to me once from Nigeria. Yes it might have taken a trip but well worth the wait. Those are to die for blues. Great collection. Thirty years ago my IRS tax return check was blowing around on the streets in downtown Grand Rapids, Michigan. A responsible citizen picked it up and somehow found my parents address in Minnesota and sent it there. Today that the check would have been stolen along with my identity! I have lived in Lovettsville, VA for 14 years. A few years ago I ordered a camera for my daughter via the Internet. I was tracking the delivery of it which showed that it was "sitting on my front porch". Even though the camera company had my correct address, UPS delivered it to the front porch of our previous house in Leesburg, VA. UPS insisted that they could not pick it up and deliver it to us, they would have to send it back to the camera company. Our previous house had sold a couple of times, but I was able to contact the new owners and they left the package on the front porch for me to pick up. I've had issues of undelivered mail, but nothing as exotic or memorable as others! I've never had a package take a vacation to exotic places. The worst that has ever happened is when I got letters in plastic bags that had been mangled by a post office machine. The weirdest mail experience for me was when I ripped open a parcel of quilty mail to find it wasn't mine. I had one parcel that looked the same as the others (it was a BIG order) and came from an online shop I buy from, but it belonged to a lady a street or two away. I looked her up in the phone book, called her and took the now opened parcel around, hoping she had mine to swap. Mine turned up two weeks later, even though it was sent on the same day. Maybe it had a stopover somewhere interesting. I did once have a letter go to Washington state, USA, (WA) instead of Western Australia (WA). I've never had my mail missent anywhere, but we have received other peoples' packages by mistake. I havent had any trouble mailing overseas, because I stopped using the USPS, I go to a packing store, they do the forms for you and its saved in their computer. I don't recall my mail ever going missing like that, thankfully! Thanks for the sweet giveaway.